We all have heard the success stories of Google, Apple and Facebook Founders. The very idea of a computer genius coming up with a profitable innovation is certainly not news to our ears. But just imagine a person from a non-technical background doing the same. Unbelievable, Right? But not true! Although it is hard to believe for many, but there are hundreds of non-technical entrepreneurs who have raised millions worth of dollars to bring a highly technical idea to fruition. And it would be even more surprising for the readers as the list include some market leaders such as Amazon, Salesforce, Workday, LinkedIn, Dell etc. 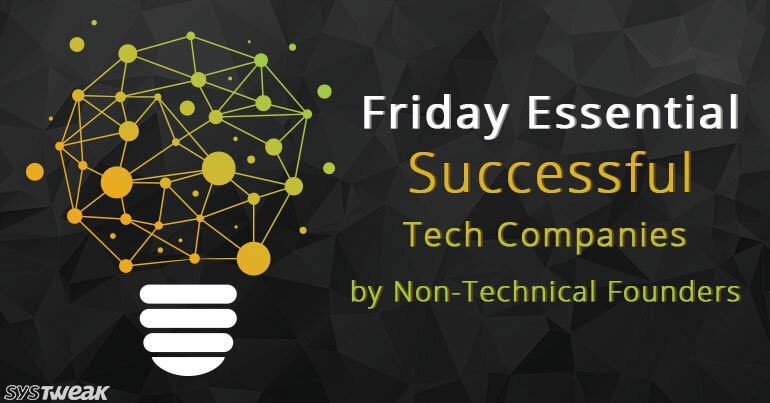 We are dedicating this weekend post to tell you about the top Non-Technical Founders in Technology. CEO and Founder of Tilt.com. Tilt originally started as a platform where people could make small loans for charitable causes in Africa. Later it became the worldwide system for collaborating all the people to pool funds for simple objective in a frictionless way online. Founders of Coffee meets Bagel. Dawoon is presently the COO and Head of Marketing. Arum Kang is presently the CEO. And Soo Kang is the Creative Designer. NerdWallet was founded in 2009, with a goal of helping people to make better choices about their money. It builds online tools that provide information, insights, and consumer driven advices about personal finance to consumers. Teespring is a world class commerce platform which empowers people to design and sell the merchandise that they love. This platform is creating new opportunities for influencers, community organizers or anyone who rallies for a particular causes or specific passions. Founder and CEO of Pandora. Pandora Internet Radio is a music streaming and automated music recommendation service powered by the Music Genome Project. He started with this company with a aim to develop a place for people to create and custom radio stations based on the liking. Founder and CMO of GetAround. Jessica founded this company with a very simple concept to help people by renting out your car to them on the days when you are not driving it. It is an online peer-to-peer car sharing service. He started out the iPhone repair service from the college dorm room at California Polytechnic State University. Today iCracked sends one of its 1600 certified “iTechs” across the country straight to customers on demand to help them fix their phones. Though this company has been shut down. But the founder did a really good job in the field of technology despite being a non-technical person. It was an online app was opened with an aim to deliver healthy organic meals within 15 minutes. It was born of the desire to provide people with the service to eat well and simple. Founder and CEO of Vida Health Inc. It is an online network of experienced health care providers and medical institutions developed to provide expert, personalized, on-demand health coaching and programs to people. It has brought a consumer mobile app, an enterprise care platform, and a marketplace of programs to offer solution 24/7 for any chronic condition. SupportPay is the only and 1st payment platform for child support that enables parents to share child expenses and exchange child support/alimony directly with each other. It eliminates all the conflicts based on child support by providing both the parents the transparency in the finances. It a free and private social networking platform for neighbors. This is available both for the Web users and for mobile devices. The neighbors could create private neighborhood websites where the people could get know each other and exchange local advices and recommendations. It is the first Kids’ Learning and Entertainment Platform which connects the kids and grown-ups. It gives them the opportunities to engage and share with each other through mobile devices and web. Tinder is one more exciting dating app for the singles which matches you with the people in your vicinity and connects them it they are both interested. It is the most popular app in the world which has more than 26 million matches every single day. It is a very unique analysis platform that analyzes and synthesizes the social conversations in real-time which is helping the brands and media to understand the public opinion about their company and make decisions accordingly. Founder and CEO of ConnectUp Corp.
We are social beings and hence relationships really matter to us. ConnectUp makes it easy to connect and reach the right people who matter or to connect with the right business associate at the right time. It was founded with the mission to help the world to connect with the beauty services they need to help them look and feel amazing. This platform also helps beauty and wellness professionals in the cities across US to manage and grow their business. Well, we all know everything about Dell and also what the company does. It is an online platform to discover and book experiences created and hosted by passionate local insiders worldwide. People can discover, buy and sell unique travel experiences comprising of tours, activities and extended trips. It is a community marketplace for people to list, discover and book unique spaces around the world through internet. You can list and book anything whether an apartment, a castle, a villa or a room and for days as per your individual needs. LearnVest has a mission to make financial planning affordable, accessible and even delightful. It has a mobile application which is compatible with both the iPhone and iPad devices which gives them a holistic view of their financial life and network. It is a San Francisco based venture capital firm that invests in companies building revolutionary technologies. This is a very unique shopping platform and lifestyle destination for the geeks who pays a lot of attention to the origins of the items they purchase. It is the leading event technology platform which is being used by hundreds of thousands of organizers to boost their ticket sales, promote and manage events, handle onsite operations and analyze results across multiple sales channels. A recruiting platform which applies intelligence to Big Data to help top talent professionals to find, qualify and engage with top talents. Smart toy is now known with the name of Ubooly which is an interactive and educational toy which talks and listens to kids while encouraging creative play. Well, this company has given a big relief to many people with hectic schedules and no time to do laundry. It is a dry cleaning and laundry service which picks your laundry on the time and location of your choice and delivers it back on the time and location of your choice. Another recruitment agency which presents a curated marketplace for the best professional makers and independent designers. It is a more easy and secured way of paying the bar and restaurants tab from your very own smartphones. This New York based e-commerce platform connects the people who design special things with the people who wants to purchase these special things. Founder and previously the CEO and Chief Strategy Officer of GiveForward. Presently the Founder and CEO Pearachute. It is an online fundraising tool for helping friends and families at rough times. It is the first place to look to for giving and receiving meaningful support. It is a digital recruitment platform which uses Artificial intelligence and applies predictive analytics on the captured video interviews to give you more insight into candidates. It offers a complete marketing and leasing management solutions for brokers and residential landlords. And also provides real-time information on residential listings. Both the management companies and brokers can manage their inventory and store and update their unit information. Needs no Introduction! The most popular and enormously growing professional and corporate networking platform for all the professionals out there. This company has set new world standards for simple, secure login, preventing unauthorized access to computers, servers and internet accounts. A very well-known online community for sharing your knowledge and work with the world in the form of presentations, documents and infographics. An online platform for saving, searching, bookmarking creative ideas uploaded by the people from around the world. People share ideas related to almost all the things whether fashion, home décor, restaurants, food, travel and as many as you can think of. It enables companies to convert their content viewers to interactive participants. An online crowdfunding platform for all those people with great ideas of changing the world to receive the support and funding for their projects. It enables artists, musicians, filmmakers, designers and other creators to raise funds. A Job search portal which lists the multimedia profiles of various companies that are hiring. Salesforce is cloud-computing company and which also offers CRM software solutions on subscription basis. A unique discovery commerce platform that redefines the retail process by giving consumers a way to do a personalized discovery of the things to sample, shop and learn about the best products and brands available. The most popular e-commerce website which actually taught the world to do mobile shopping. It is the provider of enterprise Social Media Marketing Software to help companies engage with audiences through Social media like Facebook, LinkedIn YouTube and Twitter. It is the social network for enterprises that helps the employees to connect and collaborate with the colleagues across the departments, geographies and business applications. An online media platform for the bride-to- be and groom-to-be to help them discover wedding ideas, purchase different wedding products and lots of other things related to weddings. Workday provides SaaS-based enterprise solutions for Human Resource Management which also includes payroll and financial management. The online platform for notifying the right local departments of the community service to get things fixed. It helps in transforming the relationships between the residents through technology. An online unlimited cloud storage provider for sharing and management of the content, custom branding and administrative controls. A cloud based app for all the architects which lets them save all the blueprints and construction documents on iPad and iPhones. Co-Founder and former CEO of YouTube. Presently he is the founder and CEO of MixBit. Once again, no introduction needed. We all know everything about YouTube. The above examples prove that technological innovation is no slave to any expertise. These entrepreneurs have shown how even the simplest of ideas can turn into a trending technology. We hope you found this list interesting. Please subscribe to our posts now to receive more such interesting information.